LAWRENCE — Before the brash culinary giant and TV personality Gordon Ramsay yelled at and challenged aspiring chefs on the show "Hell's Kitchen," early modern East Asian artists often used food to illustrate the wrong side of the Buddhist afterlife. However, a University of Kansas researcher says historians in Japan and East Asia have largely ignored food as part of the artists' messages about salvation and damnation in paintings from 1600 to 1868. "Food is central to human existence in that it sustains life, so logically it should have a role in the afterlife, especially in the context of East Asia where the dominant belief was in reincarnation," said Eric Rath, professor of history and author of the article "Hell's Kitchen and the Joy of Cooking: Culinary Themes in Kumano kanjin jikkai mandara," published recently in the journal Impressions. As part of the study, Rath examined the historical context of food in the paintings and Japanese life in general, including "Kumano Mandala," which featured food offerings as a component of both liberation and damnation. An image of the painting can be viewed here. "The painting provokes viewers to consider the ethical implications that particular forms of consumption have for the afterlife," Rath said. "Slaughtering animals may lead to suffering in hell as sure as diluting sake with water could cause a different punishment in the next world." Because food is a source of earthly pleasure, in the next world it could also become a form of hellish punishment when a person is denied nourishment, consumed by monsters or forced to eat nasty-tasting things, he said. "The message of the painting is to tell viewers to seek birth into a Buddhist paradise where one still has to eat, but the tasty dishes appear magically, and someone else washes the plates," he said. Aside from the artists depictions of the afterlife, historians of Japan often ignored food except when considering agriculture, famine or when it was used as a currency, Rath said. "In reading the standard history texts, it almost seems that people in the past did not have to eat, although they did have to grow food to pay their taxes," he said. People often likely overlooked it, because food is so central to daily life that it can be taken for granted. Also, there is a lack of sources for reconstructing the diet in pre-modern Japan. "Even today, how many of us can recall exactly what we ate a week or a year ago?" Rath said. "The meals that are remembered tend to be celebrations and feasts where the daily foods tend to be forgotten." This makes the images of food in the early modern paintings more valuable as sources about ordinary peoples' attitudes toward eating, life and death, he said. Food in many cultures, including Japan, is also an important part of the mourning process. 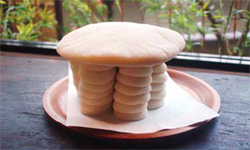 As part of the Impressions article, a Japanese confectioner at Mangetsudo in Kobe, Japan, had made rice cakes cut to resemble a person, and after Rath had noticed the image on the shop's blog, the confectioner agreed to make one to use with the Impressions article. 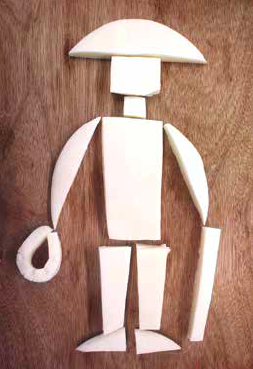 The figure was made from a large batch of rice cakes used as tradition in Japan as part of the 49th-day ceremony in which 49 small rice cakes are distributed among relatives of the deceased for consumption at a later time. Photos: Above, a figure a Japenese confectioner made from a large rice cake that was used as part of the 49th-day ceremony. Below: The 49th rice cakes are for a memorial service associated with Buddhist ritual today. The confectioner in Kobe made these cakes for displays for use in funerals conducted at Buddhist temples. After the ceremony, the small rice cakes are arranged in seven groups of seven and distributed among participants, mainly relatives of the deceased to consume at a later time. The cakes represent the journey of the deceased person. Credit: Mangetsud, confectioner in Kobe, Japan.